These bone flutes were excavated in 1986 from an early Neolithic tomb in Jiahu, Wuyan County, Henan Province, in Central China. They have been dated to 6000 BC. These bone flutes have average dimensions of approximately 20 cm × 1.1 cm (7.9 in × 0.4 in), and are made from the wings of the red-crowned crane. They are open-ended and vary in the number of their finger holes, from one to eight; the 24 holed version has 23 holes in front and one thumb hole in back. Jiahu bone whistles are much shorter than the flutes, with lengths of 5.7 to 10.5 cm (2 to 4 in), and having only a couple of holes. 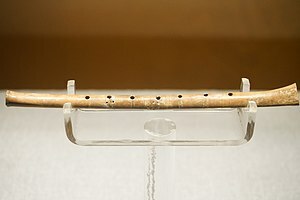 The number of holes and the spacing between the holes determined the musical range and scale or mode in which the flute was intended to function. Lee and Shen believed that the Chinese understood the "resonance of an air column" (see open tube and closed tube) and were able to create an instrument that contained their "complete interval preference of Chinese music". Blowing across the open end of an end-blown bone flute to produce a musical sound, is accomplished in the same way, and produces a similar effect, as blowing across the open top of a bottle. The eight-holed flute can play "all harmonic intervals and two registers." These harmonic intervals are said to be a "function of culture" and were of a larger set compared to that now familiar in the West. Bone flutes were apparently also played as part of sacrificial rites, and employed in bird hunting. Gudi are not very common now, but there are some musicians today who play them. Zhang, JuZhong, Garman Harboolt, Changsui Wang, and ZhaoChen Kong. “Oldest playable musical instrument found at Jiahu early Neolithic site in China.” Nature. 23 September 1999. 4 February 2007. <http://www.nature.com/nature/journal/v401/n6751/pdf/401366a0.pdf>. Huang, Xiang-peng (黄翔鹏) (1989). "Wuyang Jiahu gudi de ceyin yanjiu (舞阳贾湖骨笛的测音研究) " [Pitch Measurement Studies of Bone Flutes from Jiahu of Wuyang County]. Wenwu (文物) [Cultural Relics], no. 1:15–17. Reprinted in 黄翔鹏文存 [Collected Essays of Huang Xiang-Peng], 2 vols, edited by Zhongguo Yishu Yanjiuyuan Yinyue Yanjiusuo (中国艺术研究院音乐研究所), 557–60. Ji'nan, China: Shandong Wenyi Chubanshe, 2007. ISBN 978-7-5329-2669-5.